Wow, what a coincidence. I just found this place two weeks ago, and hiked around the farm this morning trying to find information on it. You're always a step ahead of me. The sign on the big barn says "R.H. Wright 1895." I assumed that was the year it was built. Avius, you may want to check out this earlier entry that Gary wrote. The sign on the barn isn't original to the barn. Fantastic! Thanks for the link! As a local history buff, this has rapidly become my favorite blog. I've been out exploring and researching the area on my own for years, but I only came upon Endangered Durham a few months ago; I haven't made it through all the archives yet. 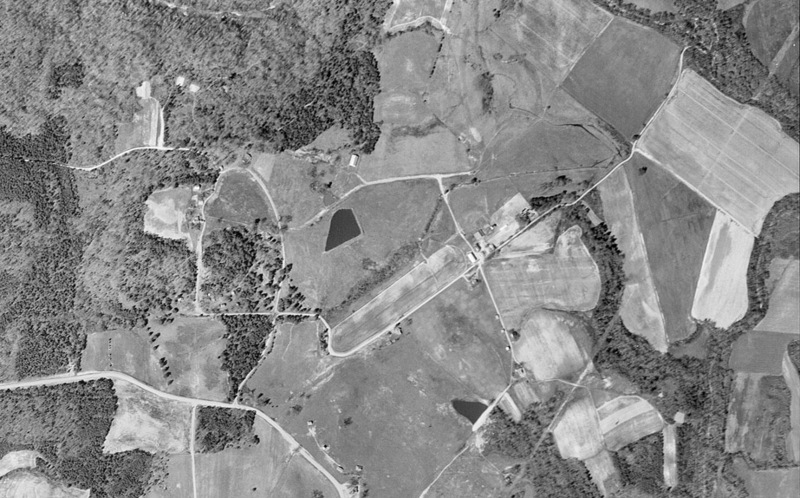 Gary, can you make out any part of old Indian Trading Path from the 1955 aerial photo? The road heading from southwest to northeast in the center of the picture (with the cluster of buildings at its crossing with another road) is the ITP. Wm. Johnston's grave is also located there. Note where the TP crosses the bottom south of Little River and then climbs up toward the farm buildings that there is a fork at the break in the road and an abandoned roadbed veering toward the south. Just east of where that abandoned road breaks to the west is Johnston's grave site, and nearby is a cellar. My brother somehow got his comments regarding the old farm/plantation posted before mine. Nonetheless, my remembrances of the Snow Hill Farm are special to my brother and me. We lived in a 3 bedroom rancher (not shown on the 1955 picture above) about a 1/4 mile from the entrance to the Farm, on Snow Hill Road (unpaved at that time). We moved there in 1959 when my father took a job with Richard Wright III, a building contractor. My older brother and I spent several years exploring the Farm and fishing the ponds within. The farm was rich with history of the plantation days, with many remnants of the slave quarters and burial sites. The farm was still in operation then, with the raising of cattle and crops, under the direction of the Dixon Family. Surrounding the farm were a number of black sharecroppers, including the Pettifors and Camerons. They farmed tobacco and corn and raised pigs and cattle for slaughter to feed their large families. There was much evidence of Indian culture throughout the area, as every year during the spring plowing we'd unearth numerous Indian arrowheads and artifacts. I recently visited the area, while on a Falls Lake fishing trip, to find how much the area has changed. Now there is a Community College in what was one of the tobacco fields farmed at the time. The entrance to the Farm and the lane itself was so overgrown I was hesitant to go too far into it. I wouldn't mind going again, but would only do it now with a group of people (and maybe a side arm). There is a lot of Wild Life in that area and it isn't all cute & cuddly. My fondest memories of growing up were the ones I have on Snow Hill Farm and the surrouding areas! I would like to find out more information about Snow Hill. My father is a direct descendant of the Forrester family who lived on a portion of this area. I have a survey @ 1755 (of which the tracts have been verified and are not "erroneous" which is written on top of the survey). that the Forrester family had a portion of some of this area- 1000 acres ( in an area mainly to just to the west of the center on the Annie Collins map. I believe an industrial cement plant is on it now. 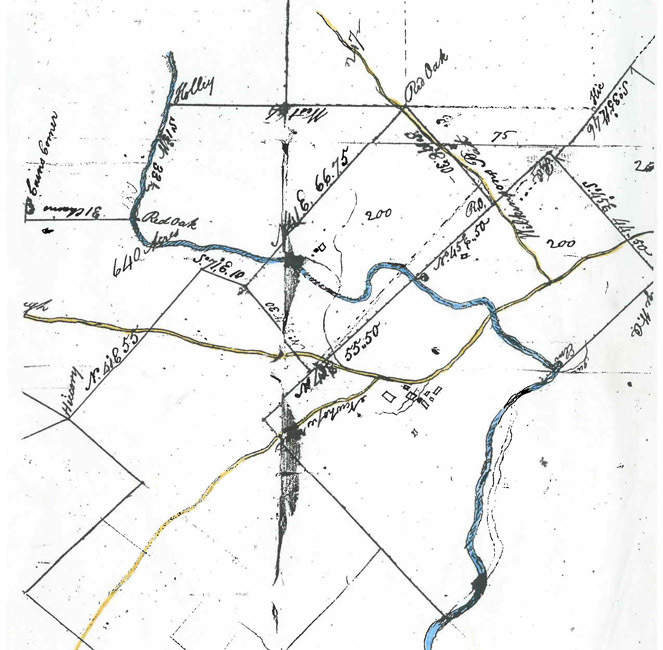 The survey includes a portion of the Johnston tract to the West, with the Dossetts to the West of the Johnstons -James Forrester Sr.'s granddaughter (Mary Drucilla Forrester dtr of Benjamin )marries into the ,Dossett family), Mr Alvez to the North. The interesting thing is that it shows the division of the land according to the will of James Forrester Sr. witnessed December Court of 1755. I cannot seem to get anyone to shed any light on this family. It is as if they never existed. All of the records that relate to this family seemed to be sealed, destroyed or buried(?) although there are some. Some of the family leaves the area just after James Forrester Sr. dies, but a few stay on in the area. I can tell you via DNA and records that we do get to this point. I am trying to get it back even further so I want to know who they came with. I have a few clues with allied families and the DNA is proving quite useful in matching migration of this family. This name is spelled many different ways -Forrest, Forrister, Forrester, Forster etc.. but no matter if there is a male line descendant of this family they will match my father with a y-male dna test. He descends from the third son James Forrester Jr. who does not stay. Any one with any clues would be most helpful. I do know they had sheep and cattle. This could be huge in giving back some lost history to the area. One of the earliest plantations in what would become northern Durham County, Snow Hill was established by William Johnston in 1763. He obtained several large tracts of land from Henry McCulloh. McCulloh and Granville were mega-speculators with competing claims, and though they reached a sort of truce ultimately, the Snow Hill grant was from McCulloh's agents without involvement of Granville's agents. McCulloh controlled 1.2 million acres of the colony of NC in twelve tracts of 100,000 acres each. Most of these twelve great tracts were square in shape with each side having a length of 12.5 miles (or 1000 chains). 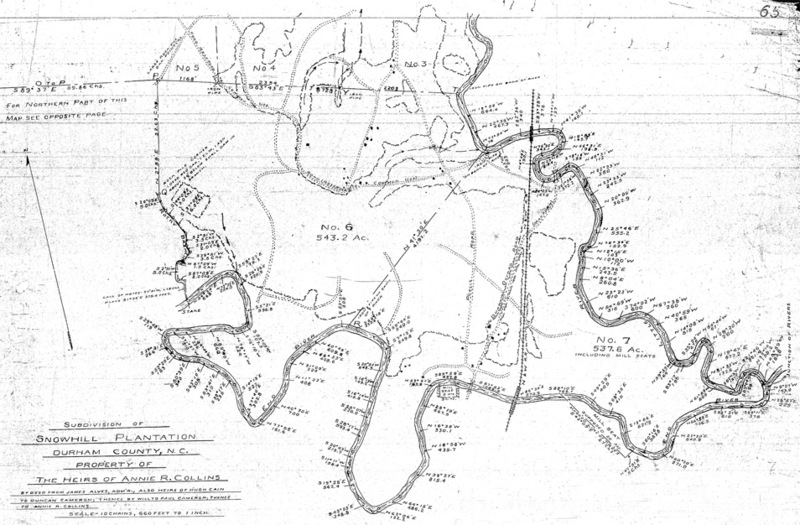 The Snow Hill plantation was granted from the easternmost of McCulloh's great tracts, being tract number 12. The site of the Snow Hill complex was not on Johnston's 400 acre grant from McCulloh but was on an older McCulloh grant to one James Rae (or Rea, or Ray, or Wray), issued on 25 March 1749. The original deed, and three others granting nearby tracts, are registered in Granville County deed book A between pages 166 and 171. On the map [below] you will see a drainage ditch or small creek that appears to run into the road near the buildings. This same ditch is evident today, and there are pits in the hillside there suggesting building sites and cellars. On the east side of Little River, you will see a T-intersection of Wilkerson's Path and the Trading Path. At that site was located Boggan's Ordinary. Patrick Boggan (pronounced Bogan, like Hogan or Logan) and James Rea acquired their grants---650 acres and 350 acres---in tandem, a 1000-acre square straddling Little River. The site of Boggan's Ordinary has been carefully excavated by the Archaeology Department of UNC. There are at least two ancient documents that speak of Boggan's hospitality. On the map, "ugh" signifies Road from Hillsborough, or Trading Path. The New Hope Road is as named. Snow Hill Map, drawn 19th century. There are eight buildings shown at the junction of the roads, and the larger building may have been the famous Snow Hill store operated by Johnston and his junior partner Bennehan. 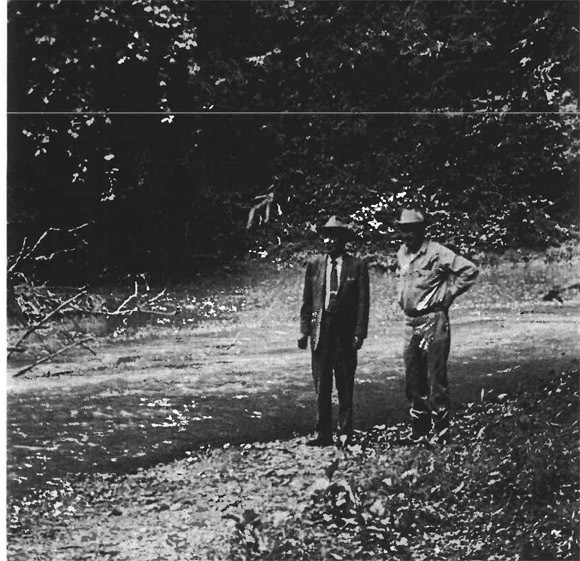 Richard Bennehan also operated a store at Fish Dam ford where Fish Dam Road crossed the Neuse River. Several years ago during an extreme drought, the Flemish bond foundations of several brick buildings were evident at that Neuse River crossing. Walter Alves provided a paced-off description of the buildings at Snow Hill for a rough survey of Snow Hill he made with Richard Henderson in August 1812. The Indian Trading Path runs through the plantation. First documented in 1670, the trading path once stretched 500 miles from a trading post near Petersburg, Virginia, to an area near Augusta, Georgia. Portions of the farm remained in operation through the 1950s, managed by Durham businessman Richard Wright, II. Durham and Her People notes in 1951 that Wright was "engaged in farming on a large scale, operating the 1500 acre Snow Hill Farm at the old Cameron Plantation. In addition to tobacco, grain, hay, and other crops, he also [raised] the famous White-Face Hereford beef cattle." (Photograph by Duncan S. Heron; copied from Eno, 2001. It was purchased as part of the Treyburn development, but never redeveloped. DR Bryan donated the land to the Triangle Land Conservancy in 2007. Abandoned early-mid 20th century buildings remain on the site, and the Indian Trading Path remains a well-worn 'road' through the woods.